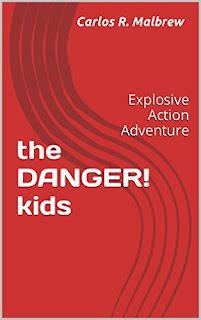 Today we are interviewing Carlos R. Malbrew, author of the juvenile action adventure novel "The Danger! Kids." My name is Carlos Malbrew a new author from Baton Rouge, Louisiana who works as an HR Coordinator at LSU. Carlos Malbrew holds and MPA and Bachelor’s degree in English from Louisiana State University and Xavier University respectively. He is also a graduate of the New York Conservatory for Dramatic Arts. He appeared on the MTV show “Yo Momma” in 2006 and co-wrote and directed the radio show “Like Us” with creator Shirley Williams in 2010. He may be contacted at crmalbrew2015@gmail.com. What starts as a boring day becomes the fast-paced action adventure of a lifetime when Kevin and Mike team up with 3 new friends to save Kevin’s mom after she gets kidnapped by the villain Pierre. Can Kev’s leadership, Mike’s patience, Army’s skill, Sal’s toughness, and Smooth raps save Kev’s mom? Or will the start of the Danger! Kids also be their end?! Ages 8 to 12 will enjoy for independent reading and kids under age 8 will enjoy having the story read to them by teachers and family members. What inspired you to write an action adventure story for kids? • I was actually 12 years old when I created the story. I was inspired to turn it into a book because it promotes reading in the best way… by making it fun. Each of the kids has a unique characteristic that makes them an asset to the DANGER! Kids!. Tell us a bit about each character and his/her special traits. • Kevin (12) starts the club, a natural leader, He is literally incapable of resisting the call to adventure. • Smooth (12) raps. Swag. His 3 fav items are his shades, his motorcycle jacket, and his gold boom box. • Army (11) is a tactical wizard who wears army fatigues and has been on missions before. • Sal (13) The oldest, the only girl, and by far the one who can fight the best. She can even beat up teenagers. • Mike (12) The most mature kid and the one who thinks before he acts. Writing Smooth’s raps and the over the top crazy situations he gets into were among my most fun to write, but I have to admit the most fun was Sal: her toughness, being the only girl and the oldest, as well as the most intense character due to her rebel spirit. This makes her a particularly compelling character. The author of the ‘Hardy Boys Detective Series’ which I know eventually was ghost written by numerous authors, those books directly inspired ‘The Danger! Kids’. When I first drafted the story at age 12, ‘The Hardy Boys’ and the ‘Choose Your Own Adventure Stories’ were my favorite books. The road to authorship began with journal time in elementary school. Standing up in front of the class to read 1 to 3 page stories. This is where I developed a skill in story -telling and connecting directly to the audience. This is when I fell in love with writing. Years later at the ‘Hardy Boys’ readings inspired me to create my own version of a full length Story. It’s much shorter than those books but 20 years ago at age 12 I was very proud to have written a story this long. All these years later I made efforts to publish but was never comfortable with the upfront costs. Amazon-Kindle provided me an opportunity. As a film writer these books are the perfect vehicle for jumping into the world of publishing while owning the rights to my material and building up my publishing company CRM International. My goal is to have a thriving publishing company in 10 years and to successfully assist and promote new authors on my blog so we can make this climb together. I hate proof reading and some technical aspects of editing. I like to create and put that creation down on paper but the proofing is very draining and threatens to reduce some of the creative juices that can flow when crafting material. Even in college at Xavier University professors wanted the work proofed better though they loved the concepts of the essays. Ultimately all upcoming projects, together known as the Launch Team will lay the groundwork for the sequel to ‘The Danger! Kids’. The new bond the characters form in the origin story will be put to the test in the sequel. When the sequel is released that will constitute the completion of phase one for the company. That what separates good stories from bad will always be the characters. These 5 are completely relatable for juveniles and younger kids. For example Sal is that girl who every thinks of as a tomboy, she’s different and finds herself in need of good friends at the time she joins the group. Meanwhile Smooth wears a motorcycle jacket during summer and he is not worried about what anyone else says. The characters stand out by being themselves. This adventure story is action packed, faced paced and a true page turner. It was created by a kid for kids 20 years ago. 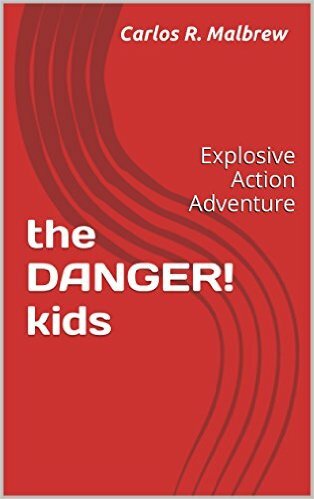 There’s no way kids won’t love having their parents read them the short origin story of "The Danger! Kids." And independent middle school readers will absolutely be holding their breath awaiting the sequel! “You’re bleeding,” Smooth said to Sal. “Yeah and now it’s Pierre turn. He crossed the line. I’m going get him.” Sal said, letting her anger take over. “You can wait,” Sal said as she walked towards her neighbor’s yard. Army pulled out a screwdriver. Sal backed up. In a few moments she heard the bike’s engine roar. “Do you know how to ride?” Smooth asked. Sal ignored him, hopped on the bike and took off. “Now YOU’RE welcome,” Army commented. “Sal’s got a temper/ heart colder than December,” Smooth rapped. But Army was serious with his reply: “I thought the adventure was almost over. But now…now all I see is… danger!